MommaPeachez had a bountiful harvest of butternut squash this year. Four of these Tennessee grown squash made it home with me, thanks mom. Butternut squash can be intimidating. They have a rock hard exterior that can easily deflect even a sharp kitchen knife. They are big and heavy. What to do with four of them?? I've challenged myself to find some new recipes and to use up every single one of them before, say, my youngest daughter graduates college. That should give me plenty of time. Or I could cook them up this winter. yeah. 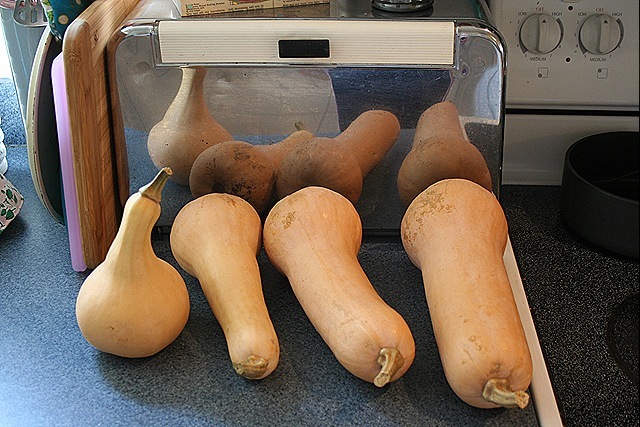 My trick to managing these behemoth squash is the microwave. Cook the whole squash in the microwave on high for about 5 minutes. This will soften it up enough to make it easy to split open. Cut the squash right down the middle, scoop out the seeds and put it back in the microwave for 12-15 minutes on high. There you go, cooked squash. Squash #1 went down today. 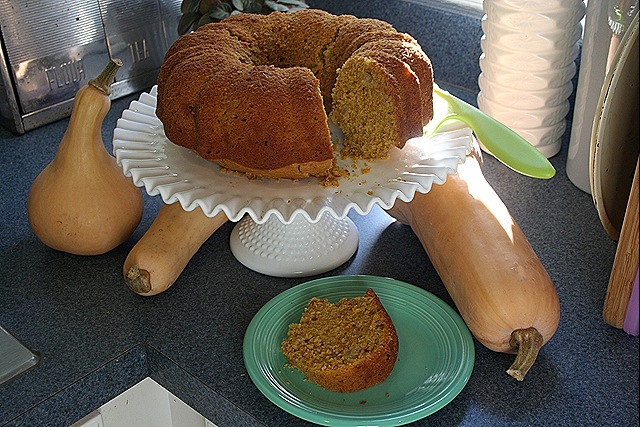 I adapted (substituted squash for sweet potatoes) this recipe for Sweet Potato Pound Cake that was in my paper this week. This recipe comes from a new cookbook by Melissa Gray and is titled All Cakes Considered. Melissa is a producer for "All Things Considered" on NPR and she tested all her recipes on the "All Things Considered" staff. I love pound cake and this one is delicious. yum. Squash are really good for you. They’re great diced into stew too. Hey, I’m a poet. My Mom made “pumpkin” pies with them all the time. You couldn’t tell the difference. That looks yummy. I love yellow squash but I’ve never tried butternut. Now you have me thinking. That looks yummy! I tried butternut squash for the first time last week in the form of ravioli. It was sweet and a little different, but still good! I use it instead of pumpkin in pumpkin pie. Serioulsy, you cannot tell the difference. You MUST roast the seeds too!! They are SOOO Yummy!! Do them similar to pumpkin seeds – but they are much better (crunchier and not as tough and chewy!) mmmmm…. On my way to get butternut squash! Trader Joe’s sells it peeled and cubed! Thanks for the recipes. My favorite dish at my favorite pasta place is Rigatoni Zucchati. LIGHT cream sauce made with rosemary, mixed with fresh spinach, mushrooms and sauteed butternut squash, poured over pasta. Delish! I usually hate squash. Probably because of the texture when it’s all mashed up. This sounds like a perfect way to sneak some into my diet!